This is Your Chance to Jam with Your Favorite Musicians from ‘Solipsistic’. Musicians will have access to download WAV files of both isolated instrument Stems and Backing Tracks from the original record, for all nine songs from the debut album. Additionally, guitar players may download Guitar Tabs and Guitar Pro 6 files; which are carefully transcribed by guitarist Shant Hagopian himself. Jam Tracks of two songs “Stardust” and “Lost and Found: Insanity” are currently available through the webpage above, and more songs will become available in the very near future as soon as they are transcribed. Musicians will have access to Stems and Backing Tracks of *all* instruments in one song by using a single KeyCode. Key Codes are obtainable through www.semanticsaturation.com/jam. Once a Key Code is used it cannot be reused to unlock Backing Tracks of other songs. To download the Backing Tracks of additional songs you will need more Key Codes. “Solipsistic” was released back in January 21, 2013; featuring special guest Keyboard virtuoso Derek Sherinian (ex-Dream Theater), drummer Virgil Donati, Bassist Ric Fierabracci, special guest Andy Kuntz (Vanden Plas) vocals, and guitarist (founder) Shant Hagopian. The release was followed by a plethora of positive feedback and high rated reviews from acclaimed Web ‘Zines and Magazines like “Prog Magazine” and “Prog Archives”. The new single Stardust from Montreal based Semantic Saturation is a fabulously produced track that evokes strong imagery in the listener. Fantastic musical sensibility provided by a stellar line up including Derek Sherinian (ex-Dream Theater) help to make this track a stand alone masterpiece. a sweet punishment, painfully delicious. Music that goes beyond magic and reality, a prog-fairy-tale. The sheer brilliance created by this unique line up make Solipsistic an album that should be on your radar. Joel Rittberg from “Danger Dog Music Reviews” published a review about Solipsistic yesterday July 29, 2013. Joel loved the album so much he gave it a score of 5 out of 5! Semantic Saturation is the project of Shant Hagopian. He is a guitarist from Canada, who has played with other musicians throughout other parts of the world. What we have here is his self-produced debut. Ambivalence starts off this disc, with a very heavy groove riff, that leads into an awesome melodic lead, that becomes an instrumental version of a verse. The entire song builds upon this melody, and each time leads itself into a new part of this six minute plus opener. Make Believe, shows off Shant’s amazing melodic songwriting skills. This song feels part-Rush, part-Dream Theater in its ability to change tempos. A great keyboard/guitar trade off at the two and a half minute mark, showcases the extremely talented Derek Sherinian (ex-Dream Theater and many others) on keyboards. Sherinian and Shant go at each other, like its a heavyweight boxing fight, trading blows. Lost and Found Insanity has a very cool keyboard melody that repeats throughout this intro, that reminds me of an old eight-bit video game. With a very warm guitar lead that joins the song a minute in. Around the minute and a half mark, Shant shows you his project is not about how fast he can play, but how great of a songwriter he truly is. The next song Stardust shares the same common melodic sensibilities as Lost and Found Insanity. Blessing in Disguise will remind listeners of John Petrucci from Dream Theater, especially the 2000, Metropolis Part 2, Scenes From A Memory. Its a truly beautiful melodic piece of instrumental progressive rock. The last twenty seconds again, showcases his idea of less is more, substance over quantity of notes played. 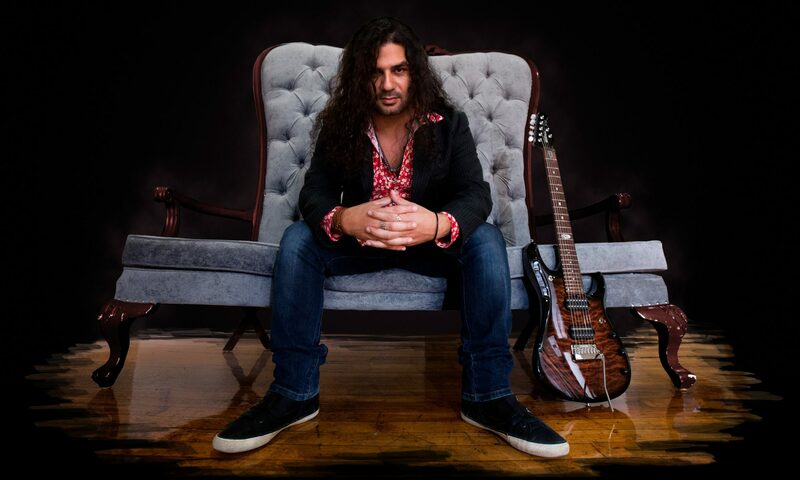 Armchair Activist, has a very Surfing with the Alien Satriani meets Passion and Warfare-era Steve Vai, a solid rocker, that showcases Shant’s abilities. This is probably the most technical song on the disc so far in my opinion and it also showcases a short break between drummer Virgil Donati and bassist Ric Fierabracci. Point of Singularity is a beautiful clean guitar and atmospheric keyboard piece that introduces a melodic guitar solo near the last minute of the song, that takes the song to new heights. This song would not be far out of place in an old sci-fi movie, with its keyboard tones. Time Is An Illusion, is another masterpiece like Make Believe, without writing the same song twice. The last song, What if We All Stop, is the only song that features vocals. Those vocals are provided by the very talented Andy Kurtz of the German band, Vanden Plas. The open features a beautiful melody with Kurtz’s vocals coming in. The song turns into a full on prog-a-thon halfway through, and its definitely a welcome addition, to the instrumental tracks before it. Solipsistic is an amazing piece of art. It’s a journey of musical emotions that reaches amazing heights, that brings us back down to earth when its ready too, not any sooner. Easily recommended for fans of Derek Sherinian’s music, or for those who appreciate instrumental guitar music, that isn’t about how fast you can play through every song. Ruard Veltmaat from the Dutch web’zine “Prog Wereld” posted a review of Solipsistic yesterday. Here’s the original review in Dutch, and Google’s translation attempt below. Een uitgedacht marketingplan, een gelikte cover, strakke uitstraling en een uitgebreide promosheet van maar liefst vier full color pagina’s. Daar maak je absoluut indruk mee. Voor je ook maar één noot gehoord hebt, ben je al min of meer onder de indruk. Zo zie je maar weer, de eerste indruk is belangrijk. Mastermind achter het project “Semantic Saturation” is Shant Hagopian, die zelfs op de promosheet de uitspraak achter de naam in lettergrepen en spreektaal heeft geformuleerd om enige verwarring dan ook helemaal uit te sluiten. Hij heeft passie voor dit project en dat is goed te merken. Hagopian is van Syrische afkomst en was eerder gitarist in de band “Nu.Clear.Dawn”, waarmee hij in 2003 de eerste Syrische metalplaat ooit mee uitbracht. Nadat hij in 2005 naar Canada is verhuisd, heeft hij een eigen handeltje opgezet met als resultaat dit album, waar hij hulp krijgt van beunhazen als Virgil Donati, Derek Sherinian en Ric Fierabracci. Niet de minste artiesten dus. De muziek die Hagopian en zijn collega’s maakt, is op de laatste song van het album na volledig instrumentaal en zit werkelijk waar volgepropt met gitaarelementen. Niet helemaal onlogisch natuurlijk. De progrock en metal die de gelegenheidsformatie ons biedt, wordt gecombineerd met elementen uit de jazz maar laat bijvoorbeeld ook gelikte toetsenriedels horen van Derek Sherinian. Zo is Lost And Found – Insanity door een op het oor eenvoudig toetsendeuntje ontzettend lekker te beluisteren en krijgt de op Dream Theater geïnspireerde muziek een moderne toets mee. Vigil Donati heeft zoals gewend een directe manier van drummen en kan ook op dit album diverse maatsoorten op weergaloze wijze combineren, hoewel zijn aandeel mij persoonlijk iets te ver naar voren is gemixt. Zoals gezegd is de plaat toegespitst op de gitaarkunsten van Hagopian, maar hij weet zijn kunsten op intelligente wijze te etaleren op de cd. Ik krijg nergens het gevoel van: “kijk ik eens wat ik allemaal kan met gitaar”, wat voor gitaarvirtuozen een beheersing betekent. Nee, Hagopian gaat voor onderhoudende riffs, verfijnde melodie, gecontroleerde tempowisselingen en complexiteit. De toevoeging van Vanden Plas zangerAndy Kuntz in What If We All Stop is daarom een extraatje, maar was uiteindelijk geen noodzaak om de boel ”˜op te leuken’. Uiteindelijk is niet alleen de eerste indruk sterk, maar ook het hele pakket dat Hagopian laat zien en horen. De productie is meer dan in orde, de muziek is zeker voor liefhebbers van instrumentale muziek met voorkeur voor de gitaar een aanrader. Persoonlijk had ik zelf graag wat meer vocale inbreng gehoord en dan met voorkeur ook nog een andere zanger, maar ook hier geldt de gouden regel: ieder zijn eigen smaak. Devised a marketing plan, a slick cover, sleek appearance and an extensive promo sheet of less than four full color pages. There you will definitely impress. Before you even heard a note, you are more or less impressed. So there you have it, the first impression is important. Mastermind behind the project “Semantic Saturation” was Shant Hagopian, even the promo called the verdict after the name into syllables and colloquialisms has formulated some confusion therefore be ruled out entirely. He has passion for this project and that is very noticeable. Hagopian is of Syrian descent and was previously guitarist in the band “Nu.Clear.Dawn”, which in 2003 the first Syrian metal album ever being released. After he moved to Canada in 2005, he has set up own business and as a result this album, he gets help from bunglers as Virgil Donati, Derek Sherinian and Ric Fierabracci. Not the least so artists. The music Hagopian and his colleagues make is the last song of the album after completely instrumental and is really true crammed with guitar elements. Not quite illogical course. The prog rock and metal that gives us the opportunity formation, combined with elements of jazz but also allows such slick toetsenriedels hear from Derek Sherinian. So Lost And Found – Insanity by a simple button on the ear tune very nice to listen and get on the Dream Theater inspired music with a modern touch. Vigil Donati has used such a direct way of drumming and is also on this album several signatures on combining unparalleled manner, although its share me personally a little too far forward is mixed. As mentioned, the album focuses on the arts of guitar Hagopian, but he knows his art intelligently to showcase on the CD. I never get the feeling of: “I look at what I can do with guitar”, what guitar virtuosos a control means. No, Hagopian goes for entertaining riffs, exquisite melody, controlled tempo and complexity. The addition of Vanden Plas vocalist Andy Kuntz in What If We All Stop is therefore a perk, but was ultimately no need to get things “to spice”. Ultimately, not only the first impression strong, but also the whole package that Hagopian shows and hear. The production is more than okay, the music is definitely for lovers of instrumental music with preference for the guitar a must. Personally I would have liked a little more vocal contribution heard and then preferably also another singer, but here is the golden rule: to each his own taste.